New Mexico is the third sunniest state in America. Because of this, it could be a gardening paradise, growing many plants that need long growing seasons and extensive sunshine. However, New Mexico also has very expensive water overall. Some cities in New Mexico, like Sante Fe, charge more, even in per gallon terms, to higher users of water - something called tiered pricing. This means maintaining a garden purely on water from the tap can get very expensive, especially with water hungry raised beds. However, unlike most dry places, Sante Fe and its greater metropolitan area actually get more rain in the height of the growing season, something unusual for the American Southwest. Rainfall averages more than 2 inches in July and August, more than any other months. June, September, and October are the third through fifth wettest months in this area. Clearly, if this water could be effectively captured, it may be able to be used by garden plants. That is where a new invention called the Groasis Waterboxx PlantCocoon, or Waterboxx for short, can be used. The Waterboxx is somewhat like an individual rain barrel for plants - but instead of needing a big roof to capture the water and then a hose (and hill) to transfer it, the Waterboxx does all of these functions itself. A cross section view of the Waterboxx showing function - water is collected by the tan lid, channels through the siphons shown in red into a green reservoir. The Water is then stored until the soil is dry enough to pull it through a white wick to the roots of the growing plant, in the central opening of the Waterboxx. This device collects rainfall and dew when available and stores it for later use by a plant, which is planted in its center. You can how the Waterboxx works in the video below. The Waterboxx allows many different plants to be grown. The Waterboxx is set up at the beginning of the growing season. At that time, 4 gallons of fresh water are added to the Waterboxx. For many plants, no further manual watering is needed, even with minimal rain. This is evident in the pictures of a tomato growing with the Waterboxx below. No water was added, even during the 2015 drought in Sacramento County, California, during the entire growing season. The maximum temperature during this time was 106 degrees and there was less than 0.25 inches of rain recorded - during the entire growing season. 54 Tomatoes were produced by this plant during the scorching, nearly rainless Sacramento, California summer of 2015 - all without one drop of water added after planting. 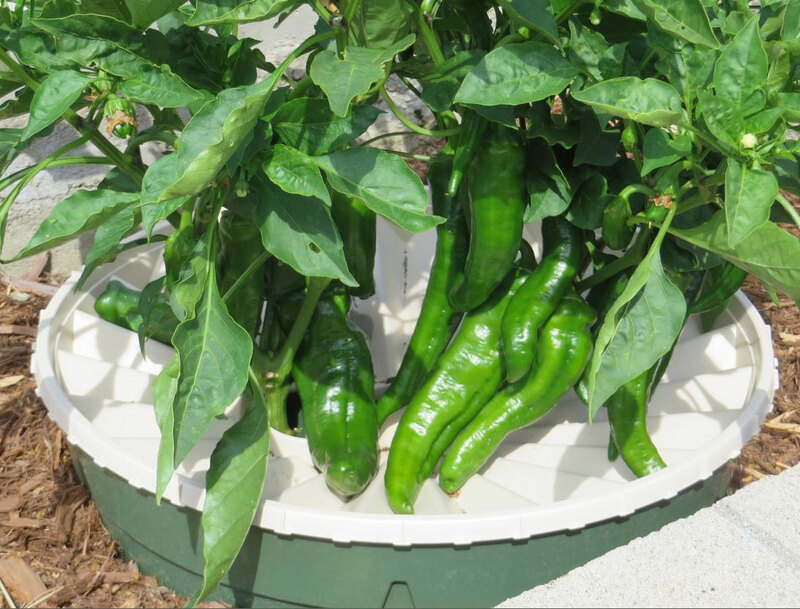 The peppers were grown in the California drought with only once weekly watering (because the Waterboxx had extra wicks inserted). 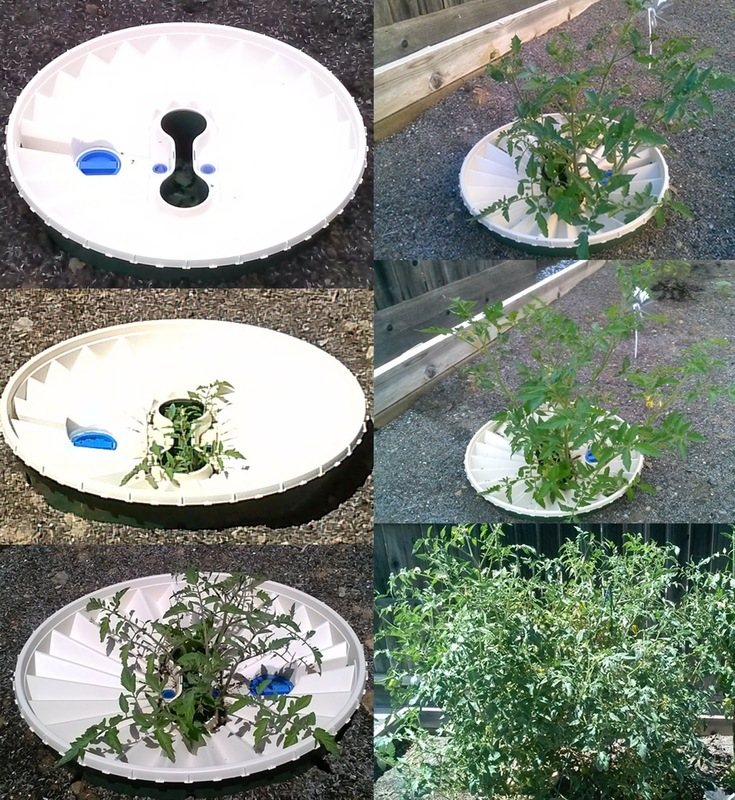 The Waterboxx also works extremely well for tomatoes and vine plants like melons. Tomatoes need very consistent moisture, which is easily provided by the Waterboxx, preventing splitting, even after heavy rains. Melons and tomatoes growing in southern California with the Waterboxx, which is hidden in the background. The Waterboxx can decrease the amount and potentially eliminate the ongoing water you must apply to your garden. Four gallons at set up can be enough for up to two plants for an entire growing season. For those in and around Sante Fe, the Waterboxx can be a way to use expensive tap water effectively, capture rainwater, and still grow a beautiful, productive garden. The Waterboxx can be excellent for community, shared, or church gardens as it greatly decreases the water bill and also decreases the amount of time needed watering. You can find out more about the Waterboxx, including how it can be used to grow trees, at our website, www.dewharvest.com. There we sell the Waterboxx with discounts on large orders and free shipping. If you would like to learn how to grow plants without watering with the Waterboxx, the best resource is the book The Waterboxx Gardener: How to Mimic Nature, Stop Watering, and Start Enjoying Your Garden available here on Amazon.com. Very useful information. Thanks for covering the topic so well, i like your article.